Prime Ocean Front View, A/C In Both Bedrooms, Turtle Watching Year Round! 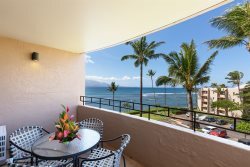 Prime Ocean Front at the Milowai Complex in the quaint harbor village of Maalaea (the most central location to all points of interest you will want to explore). Milowai is known for the abundance of turtles that frolick and feed right out front everyday that you can watch from your lanai also known for overlooking the famous freight train waves that kick up when Mother Nature decides! NOTE: Air-Conditioning in bedrooms so you can sleep cool and comfortable! Revel over the sights of the Maalaea Bay, the majestic volcano "Haleakala" and the sparkling and romantic Kihei lights across the bay at night. Breath in the fresh ocean air and feel the tropical cooling breeze while sipping Mai Tai's on your lanai. The entire place is tastefully decorated with the spirit of Aloha in mind. Master bedroom suite provides a comfy California king size bed with ensuite master bathroom (tub/shower condo) and cable tv. Guest bedroom with comfy queen size bed and cable tv. Updated guest bath with tiled walk-in shower. Air-Conditioning in bedrooms for cool comfortable sleeping but no really no need just open the front door and the lanai door and let the cooling trades breeze through! Free secured wifi , internet, cable, free long distance to US/Canada and own in-house full size washer and dryer. Kitchen has stainless steel appliances, granite counter top and very well stocked for the cook in mind. The elevator is conveniently located nearby and parking is assigned. Other coveted amenities to enjoy are of course the large pool, very nice and inviting bbq and dining area, pool side lounges and pool side his and hers bathrooms. Condo also provides for your fun... beach chairs, beach umbrella, beach towels, binoculars for whale watching (when in season) and a cooler for your excursions. Girl's Trip perfect spot This trip to Maui was for myself and my best friend from high school, celebrating our 50th birthdays. The condo was perfect for what we wanted--each to have our own bedroom and bathroom, roomy and well-appointed kitchen, ocean view with comfortable lanai furniture, a covered parking spot, and SEA TURTLES EVERYWHERE! I will point out that this part of the island is VERY windy, which didn't bother us but might be a factor for some. We traveled just a few miles from the condo to excellent, wind-free beaches (Polo and Makena were our favs). We did not have to use the air conditioning units but instead just opened the lanai door and the front (screened) door and let the wind do its thing! There are good ceiling fans in both bedrooms and one in the living area. Very comfortable beds, good sheets, and ample linens (bath and beach). Also beach chairs and boogie boards! Just a great, relaxing trip overall! Gorgeous View from Lanai!! This condo was absolutely beautiful, just as described. We felt very welcome from the moment we entered. It was nice to have two bedrooms & two bathrooms & a big, well equipped kitchen. Everything we needed was here, including beach chairs, beach towels, & binoculars, which we used to watch whales & sea turtles. The view of sunrise over Haleakala from the lanai is breathtaking. Snorkeling to Molikini was a short walk to the harbor & a boat trip away. Day trips to Lahaina, Hana, Paia were easy to get to by car. We would definitely stay here again! Perfect Little Paradise On Maui! This renovated condo is exactly as shown and described. The 2 bedrooms are large and each have a full bathroom (1 attached, 1 off the hallway). The kitchen was extremely well-appointed with dishware, serving ware and cooking utensils. I was delighted there was even a Keurig! We loved the beach chairs and lovely beach towels and the best part of the condo were the binoculars supplied so we could enjoy the many whales and turtles in the bay. We have stayed in Kihei on previous trips but this location was extremely quiet, and we had the vantage point of enjoying BOTH sunrise and sunset. This condo was perfect for 2 adult couples. Andreas was extremely attentive and wanted to ensure we had a comfortable and enjoyable stay. Will definitely recommend and hope to visit again one day! Mahalo!! From the moment you enter this property, you will be overjoyed by the lanai and the view of the bay. Well-appointed kitchen, two full baths and, in addition, beach towels, boogie boards, a beach umbrella, and beach chairs. place is quiet, really well-located and parking is always available.